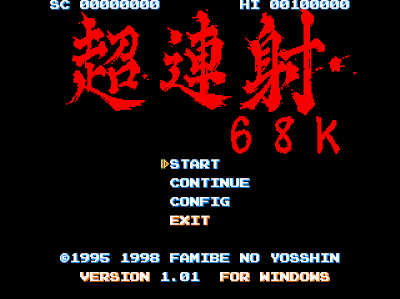 Cho Ren Sha 68k (not actually 68kB) is your generic vertical shmup. 16-bit niceties from an obscure japanese computer and a jarring bleepy soundtrack meet up over coffee to discuss how much they hate you. As usual, you pilot your angular craft like soap in a fat man's bathtub - squirting from side to side whilst deftly avoiding the overwhelming mass that threatens to crush your liberation and independance. The familiar arrow keys + Z and X controls pose no problems for people who know what's happening. The lack of auto-fire and unusual fanning motion of your default weapon means the player has to tap out a constant beat in order to hit what's directly in front. The difficulty isn't too soul crushing. The bullet patterns never force you into pixel-perfect dance routines, nor does it require the amphetamine riddled twitchyness that defines so many of the genre. In fact, this game is pretty accessible as far as vertical shmups go. The graphics quickly get repetitive and the backgrounds remains constant throughout play. The game never offers anything to stand out from others in it's genre and provides nothing more to improve it's replay value. Cho Ren Sha 68k runs fine on Vista, with some jarring sound issues sporadically affecting the soundtrack.